Over recent years, the massacre of wild species has reached an industrial scale, in particular the poaching of animals for their ivory. In Gabon alone, some 11,000 elephants have been killed illegally since 2004. In 2012, almost 700 rhinoceros were poached in South Africa. Just this past April, an armed militia went into the Sangha Trinational transboundary World Heritage site (Cameroon, Central African Republic, and Congo) and slaughtered at least 26 elephants in Central African Republic in the space of a few days. Throughout most of sub-Saharan Africa, elephants are now being killed faster than they can reproduce, with 2012 the bloodiest year in decades. This unprecedented increase reflects a change of scale in the way poaching is conducted: it is now no longer done in a ‘traditional way’ but is conducted by heavily armed groups with a lot of equipment, determined to sell their spoils to the highest bidder in the global market--which is fueled by soaring prices and demand for ivory and rhino horn, primarily in Asia. We are not just talking about animals. This is about the kind of relationship we want to build with the environment we all depend upon. Violations against nature ultimately weaken the foundations upon which communities are built and hope to prosper. This is the reality for thousands of men and women who live from the resources of the Congolese Basin, and depend directly on these forests for their livelihoods – whether for sustenance or for activities linked with the preservation of fauna and flora such as tourism. It is the case for Africa in general and for humankind as a whole: the forests of Central Africa are the richest resources of the continent and are, after the Amazon, the second lung of the planet. This heritage cannot be damaged without far-reaching consequences. Elephants play a vital role in the preservation of this environment: they enable the reproduction of many tropical tree species, and are the “gardeners” of the ecosystems in which they live in harmony with local communities. 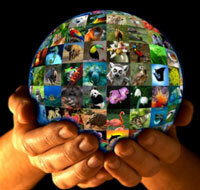 Biodiversity is as vital for nature as cultural diversity is for humankind. By emptying forests of the animals that inhabit them, poaching is transforming vibrant, living forests into deserted spaces which, in turn, causes immeasurable damage. To protect these large mammals, the first step is to protect durably their habitats. UNESCO’s World Heritage sites and biosphere reserves were created for this reason. At present, they are the highest level of protection and management available for natural sites. This of course is not enough. The Sangha Trinational site is one of the best preserved sites in the world. It was inscribed on the World Heritage List in 2012 as the result of many years of remarkable work, the first of its kind to put in place a system of joint conservation involving three countries but also many other international cooperation agencies and NGOs. Only one year after this landmark inscription, the area was attacked by a small group of armed rebels intent upon pillaging resources. First, we need to support the national and local agencies that are on the front line by giving them financial support and the appropriate training. Some rangers are sometimes only a handful of men in pick-up trucks, not sufficiently prepared or armed against poachers hunting in helicopters. Strengthening local means is an absolute priority that must be included in all cooperation and financial agreements; otherwise the efforts made towards biological preservation will go to waste. Secondly, these efforts can only be made at an international level. Animals have no consideration for international borders and neither do poachers. Countries need to cooperate in order to fight this illegal ivory trade; to protect these animals, to maintain borders and to sanction criminals and unscrupulous intermediaries. Awareness also needs to be raised in the countries to which the ivory is destined, countries where clients often do not realize the provenance of their purchases. It is a daunting task, considering the global scale of the ivory market. Initiatives do exist, and there are numerous tools to improve the supervision of fauna and to insure that the law is applied, but these initiatives are often dispersed. We must make sure we integrate them; even more so when the resources are limited. For the past few years, CITES (Convention on International Trade in Endangered Speciesof Wild Fauna and Flora) and UNESCO have been working together to publish joint data and to share their respective experiences in interrelated domains such as the trafficking of cultural assets and ivory. This cooperation makes the fight against illegal trafficking and the protection of these zones of resources possible. The concerned stakeholders, whether members of government, customs services, the police force, scientists or NGOs must strengthen their ties, because joining forces is the only way to fight this rise in organized crime against great mammals. The sustainable management of the resources of the African continent is at stake, as well as the future of the world’s heritage. By Irina Bokova, Director-General of UNESCO and John Scanlon, Secretary-General of CITES.